Although driving is an essential and routine part of most people’s lives, it can be scary to think of the risks that are associated with this daily practice. Auto accidents have devastating consequences for all involved and carry a great potential for significant property damage and serious personal injury. Considering the risks that are inherent with driving, you would think that all people would do their best to ensure that safe habits were being practiced on the road. Yet, every day, a great number of drivers choose to use their cell phones while driving, a practice that has been proven to increase the risk of auto accidents. For his clients in San Diego who have been injured due to cell phone use and auto accidents, attorney Chris Olsen offers legal representation to help ensure that fair and just compensation is provided for damages that have been suffered as the result of this reckless driving habit. Because cell phone use while driving increases the risk of auto accidents, it carries the potential to cause serious damage, to both property and people. Auto accidents that are caused by cell phone use can result in any number of injuries, including whiplash, burns, brain injury, back injury, and even death. 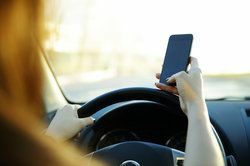 Victims of auto accidents that are linked to cell phone use while driving have a legal right to seek financial compensation for damages that have been suffered. Attorney Chris Olsen can advise clients on their individual case and inform them of what type of damages could be collected, which may include financial compensation for medical expenses, lost wages, property damage, and pain and suffering. When an auto accident has occurred, it can be difficult to work with insurance companies to ensure that all due compensation is collected. Personal injury attorney Chris Olsen has a history of successful legal representation in auto accident cases and will work hard to ensure that his clients receive fair compensation for damages suffered. If you are the victim of an auto accident, schedule an appointment to discuss the details of your case and learn how Chris Olsen can help. We look forward to hearing from you!